Wilf Whitfield mentioned above was my grandfather who died in 1995. On looking at the photograph I’m certain that he is actually the 3rd person from the left In the 3rd row and not the person named as Ken Mantle. However I can confirm that the person on the far right of the 2nd row is most definitely not my grandfather. Would be delighted to hear from anyone who wishes to comment. I am Ken Mantle’s daughter and can say in all honesty that it is definitely my dad standing next to his brother Jim. They joined the Local Defence Volunteers together and were inseparable even to the point of standing next to each other in the photograph. I am one of the administrators of the Heritage Society and am very pleased that you are interested in looking at our photos on the website. Hope you are able to find the information you are asking about. Front row, second from right is my father Fred Cramp. Cyril Deakin 1921-2011, born, married and died in Killamarsh. Married Joan nee Dixon who is still alive and lives in Killamarsh, daughter Margaret still lives in Killamarsh. Cyril’s brother in law was Ernest Cramp 1908-1986, Ernest married Doris nee Dixon 1912-2010. Cyril was a collier at Waleswood and Westthorpe collieries and a butcher’s boy at Snowden’s on Kirkcroft lane, circa 1935. Cyril had many siblings and his mother was a Mather from Eckington, the Mather’s go back many generations in Eckington. The house was Mr Robinson’s. He was a retired Sheffield Bobby who had retired to the smallholding along the northern bank of the canal upto the Nether House farm. Part of the out buildings was occupied by the Eberneser Chapel on the right at the top of Bridge Street. The house in the background was Mrs ? ‘s next door to Mrs Goodwin’s on the South side of the canal. 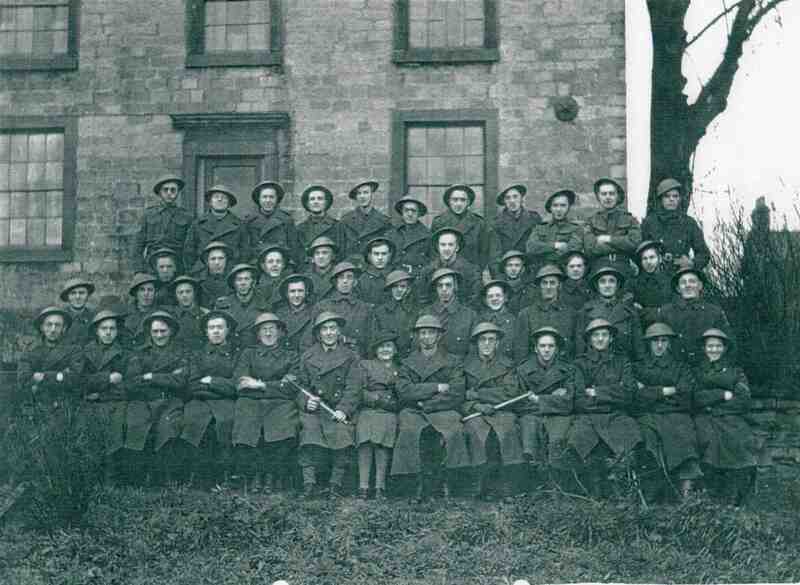 Killamarsh Home Guard circa 1943, Courtesy of family. Back row. L-R. George Dumbleton, Johnny Bingham, George Jones, Ken Goodwin, Johnny White, Sammy Hagin, Bill Sidaway, Harry Clementson, Bill Parr, Ralph Batterham, ? Cox. 3rd row. Colin Gaye, Jimmy Mantle, Ken Mantle, Cyril Deakin, Harry Watts, Les Barker, Arthur Flint, Lewis Fox, Frank Draper. 2nd row. Jimmy Maloney, Colin Hargate, Micky Oldfield, Graham Beddham, Edgar Goodwin, ? Howe, Cyril Flint, Wallace Marshall, Bill Brookfield, ? Bower, Charlie Hall, Wilf Whitfield. Front row. Albert Whitfield, Joe Watts, George Marsh, Eric Watts, Jack Pinder, Ernest Hall, Mrs Robinson, Lt. ? Robinson, ? Jones, Dennis Watson, Plum Marsden, Fred Cramp, Frankie Lane. Yes thats Plum (Arthur) Marsden Third from end, bottom row.